Well-trained soldier or genetically engineered monster? Junco Coot can’t even remember her trip off Earth; she was too busy being morphed into her new avian body. But reality hits her hard when she wakes up to find her new life is not what she expected. Not even close. In most places the avian Fledge ritual would be nothing more than mass murder, but here in the capital city of Amelia, it’s called growing up. Junco has two choices: fight to the death to prove her worth, or get sent back to Earth in the hands of her enemies. In a foreign culture and surrounded by people she can’t trust or count on, Junco must find a way to save herself and Tier without losing her immortal soul in the process. J.A. 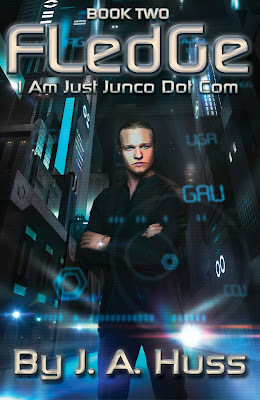 Huss's I Am Just Junco series continues in a pounding sequel. The storyline is cleaner and it's easier to envision this futuristic world Junco was born into. Fledge expands Junco's character and her world, and the story's plot digs itself deeper into readers' minds. Junco is now on the Avian planet Amelia and she is now an Avian herself. While Tier is on trial for treason, she struggles to find a place in her new life. She becomes acquainted with friends of Tier's. Her easy camaraderie with Ashur, Braun, Isten, Arel, Mish, Ryse, Rikan and eventually Lucan the Commander, is refreshing. I love to see this many characters extend such a strong bond with the main character, especially one in need of support like Junco. It's also a plus that Huss was able to make their relationships come about and progress naturally: bonding time, fights, making up...her touch was indeed realistic! Fascinating characterization aside, Huss deepens the the whole of the plot. While Fledge seems to take our minds off of the mess Junco and Tier left of Earth, we see that Avian life comes with it's fierce challenges as well. Junco learns she must fight to the death to keep her life and her spot as the '9th' on Tier's team, the 039. She takes the chance, forming bonds with few of the other contenders while balancing new discoveries about Earth's status and Tier's fate. I have to admit that this ordeal showed more layers of Junco, even more than what had been glimpsed in Clutch! I had an easier time of feeling her devastation about the past and present woes, so much easier that I even bawled my eyes out. Fortunately, Huss strikes a perfect balance. Whether you laugh, cry or submerse yourself further in Junco's story, you will be unable to tear yourself away from it. Even if the violence makes you wince a little, you will not want it to end because it's so alive with action, emotion and purpose.